We could scarcely believe our eyes and ears last night at the Sheen Center, where New Opera NYC produced an opera that was new to us and presented it in such a fantastic (and we do mean "fantastic") manner that we were completely transfixed. What eye candy! What ear candy! And also, dare we say, stimulus to the brain, as we consider the tale of a pompous bumbling leader who makes a pre-emptive strike on another country, following some bad advice! How resonant! King Dodon's astrologer presents him with a golden bird who will warn him of political danger and gets promised whatever he wants in return. War is declared whilst Dodon lazes about at home, relying on the bird's advice. Dodon's sons kill each other on the battlefield and Dodon himself must go. In the kingdom of Shemakh he meets the seductive Tsaritsa Shemakha who extracts a promise of marriage and returns home with him. The astrologer claims his reward--the Tsaritsa. He will accept no less. Dodon kills him. The Golden Cockerel kills Dodon. Once the thrill of the production subsides, we are left wondering whether this was all a plot of the Astrologer and the Tsaritsa to take over Dodon's kingdom. But our thoughts return to the sensuality of Rimsky-Korsakov's melodies and the lusciousness of his orchestration, so magnificently played by a full orchestra under the baton of Maestro J. David Jackson. We recall that it was Rimsky-Korsakov's Scheherazade that captivated us in our childhood, leading to our lifelong interest in classical music. Particularly memorable was the harp of Ata Svetlov, the percussion of Chui Ling Tan, and the flute section. The Asian mode lent a special exotic thrill. As The Golden Cockerel, soprano Ksenia Antonova's performance left nothing to be desired. In the tenor altino role of The Astrologer, John Villemaire's reedy tone was just right. Baritone Antonio Watts made a fine and colorful Prince Aphron with tenor Dmitry Gishpling-Chernov as his brother Prince Gvidon, equally well performed. Bass Gennadiy Visotsky shone as General Polkan and wore his furs well. As the Housekeeper Amelfa, Ksenia Berestovskaya had a fine low mezzo just right for the role, and a spunky stage presence. We might add that the chorus was superb, led by Chorus Master Alexandre Tchaplinskiy. And who doesn't love a Russian chorus! The production was by Igor Konyukhov who has established himself on the opera scene in a short period of time. We don't often meet nuclear physicists who go on to get an MFA but we can definitely relate to finding the arts more compelling than science. This polymath of a man was responsible for both direction and choreography--both superb. The entire production team brought visual splendor to all this aural delight. The lavish set design was by Zachary Crane and was lit by Greg Mitchell. Special credit goes to Oksana Ivashkevych whose LED Technology was brilliant. The eye-popping costumes were by Olga Maslova who seemed to combine Russian folk themes with Star Wars and Hair and several other influences. We were reminded of Heartbeat Opera's Mozart in Space last Halloween. We were constantly astonished by the originality which is difficult to describe. We refer readers to the carousel of photos on our FB page. Separate credit must be given to Giaconda for the headpiece of the titular character which was right on point and totally complementary to the costume. Marina Konyukhova and Elizabeth Tripp were responsible for the outstanding Make-up. We have fallen in love with this opera and will see it again in August in Santa Fe. It will be interesting to see what a different production team will do with it but we don't think that anything could surpass this production. 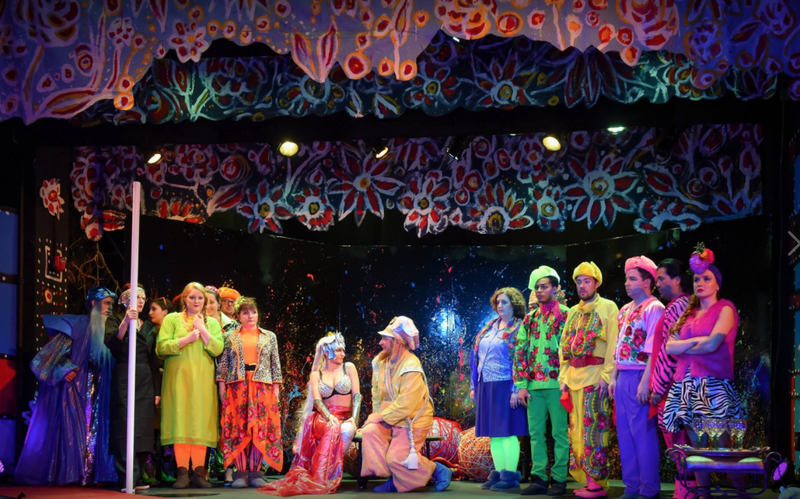 There will be four more performances and if you are lucky enough to snag tickets we think you will also fall in love with this extravagant over-the-top production This is just one event in the two-month-long New York OperaFest. We are happily overdosing.